Knowledge base - How do I register my business? Knowledge base Answers by Topic Businesses, Getting Started How do I register my business? To register your business on our website, you must enter to our website and select your country on the map to locate the business properly. Follow these steps according to if you are a registered user, or an unregistered user. On the top right section of the homepage, select "Register". 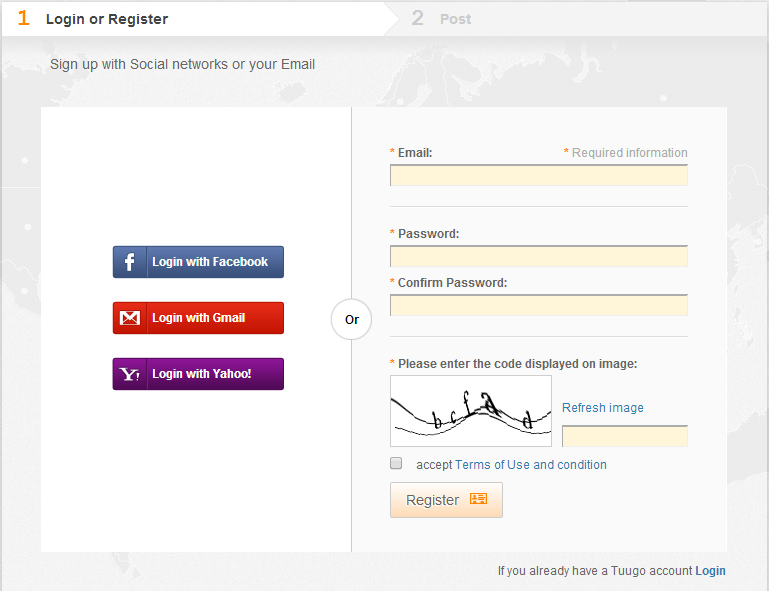 Clicking it will take you to a window in which you will have to choose between registering a company, a proposal request, or just making an user for Tuugo. Select "Post my Company, Products, and Services"
Begin the first step to enter as an user on our site, before registering your company. You can either use one of your Facebook, Gmail, or Yahoo accounts to login, or you can register an user with your email and password. After you enter this information, you will be redirected to another window where the system will inform you that your account will be activated when a mail arrives in your inbox, in which you will have directions to follow. Once you get this email, follow the link provided therein, this will take you to another window where you have all the options for modifying your company. 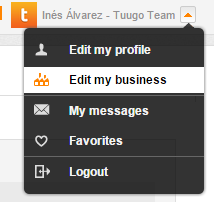 You can add a Business, by hovering over your Username, and click on "Edit my business"
Once there, click on "Add your Business"
You can also do it from the Homepage, click on "Publish your Company for free"
If you click on either one, it will lead you to the following screen. 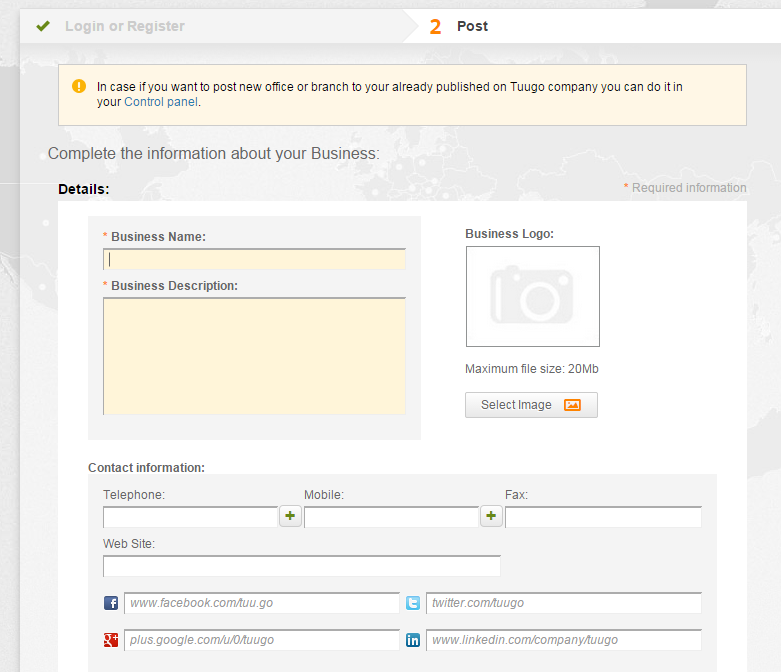 You should add the Business name, Description, Logo, Contact information, Location, Category and Keywords. Please follow these guidelines if you want to avoid banning. If you need help or if you have any suggestions, please don't hesitate to contact us! What is an Office in Tuugo?